Everything about Tecalitlan is just about perfect. The first time I came to this shoebox-sized establishment, all four tables, three counter seats, and limited standing room was taken, but I was able to squeeze myself in and shut the door. After a few moments it was discerned who was waiting for tables, who was waiting for takeout, and how long it would take to sit down. The staff and the customers were all smiling, despite their growing hunger. The couple ahead of me waited a good twenty minutes to sit down, while I was lucky to grab a barstool after ten. Despite the fast pace, the people running the show have a grace about them, and always a smile. The families at tables with children were spread out and eating happily, there was no pressure from the staff, but they all knew to exit when they finished so the next people could sit. Tecalitlan was definitely the most crowded restaurant in the neighborhood, which runs along Union and Washington Avenues just northwest of New Rochelle's main streets and train station south of the interstate. Once seated, it was easy to order having had ample time to peruse the menu and see what other customers were choosing. I was not yet in the mood for enchiladas, but noticed quite a few and made sure to take mental notes. At the high counter seat in the corner, I swiveled myself to enjoy the scene while waiting, taking in the pictures of the namesake town on the walls and all the well-managed action from the kitchen. The women doing most of the cooking looked like seasoned veterans, while an older gentleman prepared to go orders and dressed dine-in plates ready to be served. New Rochelle has been the destination of waves of immigration from people from Tecalitlan and other high-altitude towns in Jalisco and Michoacan for many decades. You see many store names on Union Avenue with Michoacan in the title, whether it be a taqueria or paletaria. 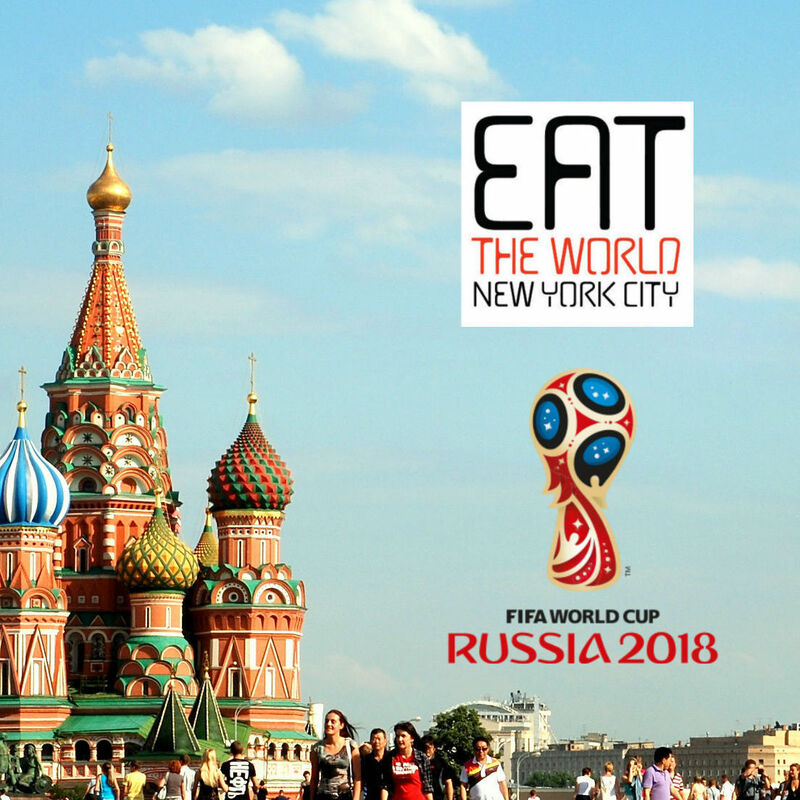 This makes its restaurants slightly different than many in the five boroughs, which have had a lot of immigrants coming from Puebla. 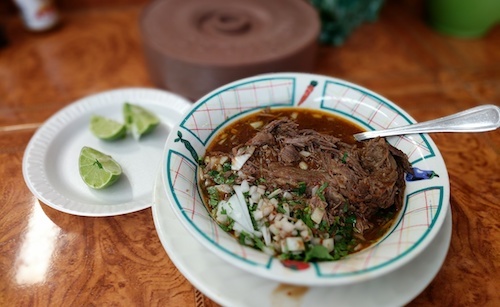 On the menu, birria has its own place, and comes with the description that it is made in the style of Tecalitlan. Birria was born in Jalisco state, where Tecalitlan resides, and I was unable to discern further if the town specifically had its own taste or whether this was just a way to say it was made as it should be made back in Jalisco. As it tends to be in New York, birria ($12, below) is made with beef. Traditionally this is a goat stew in Mexico, but getting permits for that animal is almost impossible here. Of the limited places you see with birria, they are all with beef, but the meat here is treated as it would be had the dish been meant to be cooked this way. The restaurant slow cooks the shredded beef for hours in the stew that is eventually served, full of deep colors and rich tastes. The peppers and spices are not fiery, but are very complex. Limes and plates of chilis are available for adding the correct amount of spice, but these are the types of chilis that will burn when transferred from your fingers to eyes, so approach with caution. For $14, you can try the birria with tongue (lengua). On the next visit those inviting enchiladas made an appearance. The restaurant was much less crowded for dinner on that visit, and the server offered them as the right choice when questioned about what should follow the birria in pecking order here at Tecalitlan. Even though my normal reaction to enchiladas in New York City is to write them off as gringo food with too much sour cream and lettuce piled on top, the leap was made. 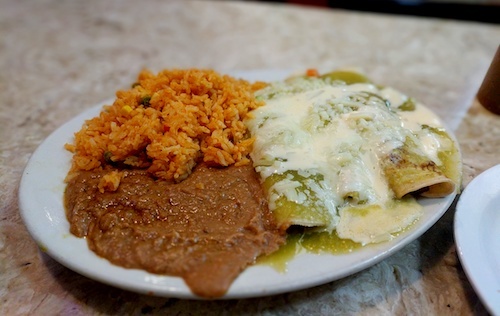 The enchiladas verdes ($12, below) are admittedly wonderful, more like you see on the West coast (or in México). The subtle green sauce and meat of your choice speak for themselves. Handmade tortillas wrap the meat and are covered with the right amounts of crema and cheese. The green sauce has a delicate tang to it that says volumes. It could be called zesty by a lazy writer, but zesty would be doing it a disservice. The rice and beans are certainly functional, but not the star of the show. The two homemade salsas that are put on the table should not be used for the enchiladas, as they overpower the delicious subtleties of the sauce. But any antojitos should make use of these, which I was told were the recipe of seven generations of the family! 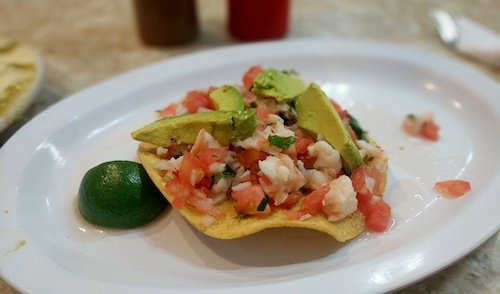 Another good use of them could be for the tostada de ceviche ($6, below), which discards the usual beans and toppings with meat between formula. The wonderful ceviche does not need those things, but is complemented well with a squirt of lime and alternating squirts from the two very different salsas. The freshness of the shrimp and crunch of crisp tostada make for the perfect bite. 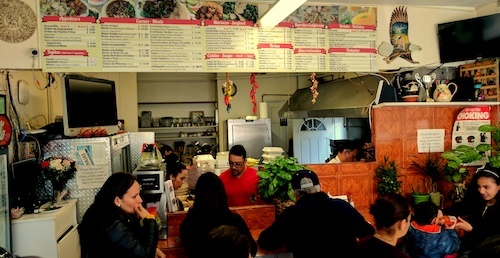 In warm months, the family runs a truck called "Teca's Tacos" a few blocks away that might be even more popular than the restaurant, as if there needed be another reason to come back to eat their food. You could also imagine this restaurant expanding and serving four times the crowd or more. 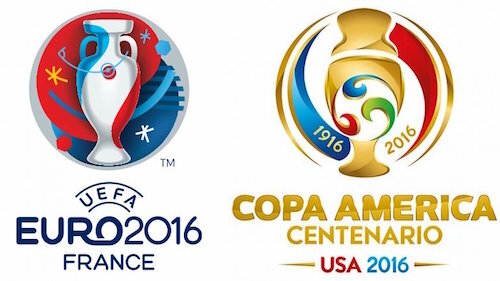 But then something very important about the atmosphere would be lost. What makes this place tick in the first place is this feeling of tight community and friendly family. It is really a sight to see, and absolutely a gem for New Rochelle.